WINNER! People’s Choice Award. The product our SkinStore customers swear by. 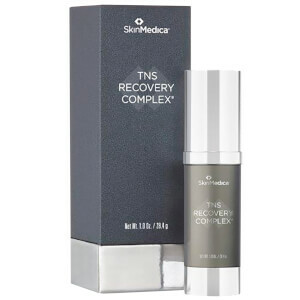 The TNS Essential Serum is an advanced, dual-phase anti-aging treatment from scientifically advanced skincare brand, SkinMedica. Suitable for all skin types, there are two separate formulations that work in synergy to smooth the appearance of fine lines and improve overall tone and texture. Chamber one contains the TNS® (Human Fibroblast Conditioned Media) Recovery Complex; a balanced, naturally-derived growth factor that delivers age-defying effects to tackle wrinkles with stabilized vitamins and antioxidant-rich plant extracts. The second chamber delivers the APS Corrective Complex – a powerful blend of peptides and nutrients to replenish and protect. Antioxidant Ubiquinone (Coenzyme Q10) neutralizes free radical damage, while Hyaluronic Filling Spheres attract and trap moisture to the surface layer of skin for maximum hydration. Blended together, the pair deliver unparalleled results, resulting in your complexion feeling more refined and even, with visibly reduced signs of aging and a younger looking vitality. Before the first application lightly tap the top of the pump several times in the palm of your hand. Remove the cap and press on the very centre of the pump to dispense both of the products onto the back of your hand. Blend the two products together and apply to the face, neck and decollete. Use morning and night after cleansing and toning. Human Fibroblast Conditioned Media, Water/Aqua/Eau, Cetyl Ethylhexanoate, Olea Europaea (Olive) Fruit Unsaponifiables, Alpha-Arbutin, Isoceteth-20, Arachidyl Alcohol, Glycerin, Ethoxydiglycol, Butyrospermum Parkii (Shea) Butter, Dimethicone, Tetrahexyldecyl Ascorbate, Dipalmitoyl Hydroxyproline, Palmitoyl Tripeptide-5, Ergothioneine, Hydrolyzed Sericin, Phospholipids, Ubiquinone, Rubus Fruticosus (Blackberry) Leaf Extract, Saccharomyces Ferment Lysate Filtrate, Aminobutyric Acid, Phytosterols, Tocopherol, Tocotrienols, Squalene, Oryza Sativa (Rice) Bran Wax (Oryza Sativa Cera), Sodium Hyaluronate, Tocopheryl Acetate, Camellia Oleifera Leaf Extract, Ethylhexyl Palmitate, Silica Dimethyl Silylate, Polyacrylate-13, Polyisobutene, Polysorbate 20, Behenyl Alcohol, Arachidyl Glucoside, Cetearyl Alcohol, Steareth-10, Steareth-20, Butylene Glycol, Maltodextrin, C12-15 Alkyl Benzoate, Xanthan Gum, Acrylates/C10-30 Alkyl Acrylate Crosspolymer, Aminomethyl Propanol, Disodium EDTA, Caprylyl Glycol, Caprylhydroxamic Acid, Ethylhexylglycerin, Phenoxyethanol, Potassium Sorbate, Parfum/Fragrance, Hydroxycitronellal, Linalool, Coumarin, Alpha-Isomethyl Ionone, Geraniol, Isoeugenol. Crazy expensive. Only lasts 2 months. But I am on my 3rd container because it works. I apply around by eyes, down to lines between nose and mouth, mouth to chin, and what's left to forehead area. The fine lines below eyes are looking better, and the forehead and mouth area lines are less deep. To make the product better, wish I could open the container to make sure all of the serum is gone. 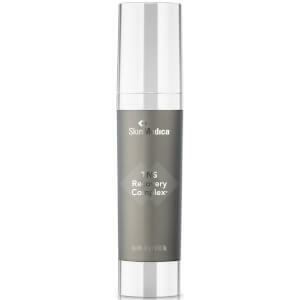 Skin Medica TNS Essential serum is a good product but way to expensive ! Everything I received was in good order. To be fair, the drying heat is on and the air is very cold here in Maine, but I am not seeing any spectacular results with twice a day application of this product. Way too expensive to be lacking any benefits?! Will not repurchase. I love this product! This is the best product for improving my pores and complexion. 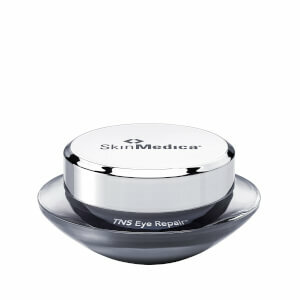 It is pricey so I just use the product mainly in the morning and a retinal at night. My complexion looks horrible when I run out! I just wish it was more affordable for working women. I've been using this product for 2.5 years, once a day, and I love it. It's pricey because it works. My skin tone, texture, and elasticity are vastly improved by this product. The location on my left hand where I mix the product looks younger than the same spot on my right hand. As a bonus, it keeps pesky break outs at bay too. Give it a shot and buy it here at SkinStore when it's on sale. You won't regret it. Over priced,,,,,stinks,,,,,Neautragena rapid repair actually works better!!! Listen this is a really nice serum (if you can get past the weird smell). I think I’ve seen some improvement with it but I use so many different serums and creams it’s hard to say. Since the results were so minimal and the price is so high, I can’t say I’ll buy it again.